Square is a neat way of capturing a credit card transaction on your iPhone. You just plug the device into the audio jack on the iPhone, then swipe the credit card. Today I signed up for Uber, and in the process, I was able to enter my credit card details by pointing the iPhone camera at the credit card. That got me thinking - is the Square device even needed? Seems a lot more convenient to just use the camera. Maybe this would cause problems with a subset of the people whose credit cards you are charging. The swipe seems "official", whereas taking a picture of the card seems scary and insecure? Over the weekend I started playing a game in Spotify. The idea is to start with an artist, and get to another artist through Spotify's "Related Artists" concept. A little like 6 Degrees of Kevin Bacon. It's fun, and you can add to the interest by playing a track as you pass by each artist. As an example, to get from Green Day to Elton John, follow this route. I also play that you can't use the Beatles, as they're probably at the root of a lot of bands. I wondered if anybody else had come up with this game, and found a similar idea here. My iPhone 4 power switch broke recently. Apple very generously replaced the iPhone even when it was a few days out of warranty. The restore from backup worked great. I hadn't encrypted the backup, so I had to re-enter passwords - a minor inconvenience. Unfortunately, I was continually alerted to needing to enter my voicemail password. I tried the usual suspects for the password, but none of them worked. I accessed the self-service for so-called Premier business customer, and there was a very useful looking menu item: "Reset Voicemail Password"
Unfortunately, there was the not-so-useful message to call a number. Being the long weekend, I had to endure this extremely annoying popup for 3 days before I could call. So I took my chances and pressed "2", gave my phone number, and spoke to somebody who said that was "Business Support" or something, said to call 800-331-0500, and transferred me to that number. After a few minute, spoke to somebody. Gave my phone number, name, employer, last 4 of IMEI number. 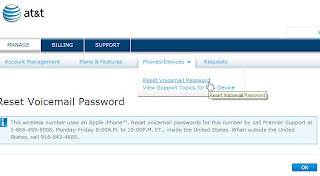 Then miraculously, I could go to the Voice Mail tab in the Phone App on the iPhone, and choose a password. Heaven - no more alerts popping up. Then the support person said "Do you want me to send you information on how to use the Self Service website?" "But I know how to use the self service website" I replied - It tells you to call the (wrong) number"
Hence followed a circular discussion - I couldn't make her understand that the self service web site was deficient, and that was why I was calling the number - not that I didn't understand how to use the Self Service Website. I've been a long time user of kayak to do flight comparisons. However, I recently started using hipmunk. I remember hearing about it on This Week in Startups and Founders Stories. It works great. There is something about the UI/User Experience that is beautiful and calming. The concept of scoring based on agony (combination of price, duration and number of stops) is awesome, as is the automatic hiding of "worse" flights. It's close to the experience of asking a personal assistant to book a flight, and having them make smart decisions on your behalf. I've written about Prosper.com previously. I'm really excited that after nearly 3 and a half years of using Prosper, I am near to making a positive return! That's right, I am now only $100 down, but I am trending to positive returns! There are so many charge-offs, that so far, all the interest I've made - $1,024.89 has been reversed by the charge-offs $1,125.76. If Prosper ever holds another debt sale, I might be positive sooner than I think. It got me thinking - it's tough to make money lending to consumers. No wonder credit cards have to charge exorbitant fees and charges. One strategy that I've been following is to monitor loans that become overdue. Then, immediately that they become Current, list in the Notes Trading section, with a tempting 1% discount. So, from this evidence, being late once is a good indicator of being late again! It would be good to test this with more data. Anyway, the process of trying to do this is a drag. It means logging in to Prosper regularly, bookmarking new delinquent loans, and checking on the status of previously bookmarked delinquent loans. I was beginning to think about scripting in Selenium, then I suddenly thought to myself - Prosper should have an API. I was thinking of the email I would send to the "Contact Us" link, and I was imagining the response "Thank you for your great idea. We'll discuss within the team", or some such platitude. I went to the Prosper Blog, and noticed an Academics Tab, and lo and behold, a link to the developer tools and data mining resources page. And on the Developer Tools and Data Mining Resource page, a link to the docs for the API's. I felt like crying - they had done the right thing. Now, to try using them. Maybe I'll still be crying, but for the wrong reasons. I enjoyed listening to the Jason Calacanis interview with Blair Harrison of Frequency on This Week in Startups. Auto Scan mode is the same as "Autoscan" on a car stereo. In this mode, Frequency will play you a 15 second excerpt of each video in the feed you're tuned to before automatically advancing to the next clip. It's the fastest, simplest way to quickly watch a series of videos to find one you want to watch in its entirety, without having to click around endlessly. However, it was not quite working as I expected. Unfortunately, the Topics are not related to the Khan Academy. Some of the clips are, and it would be nice to have Auto Scan on the clips in the search results.